As most of you probably know by now, blogger Valorie Hart (the Visual Vamp ), and her husband, Alberto, are stranded far from home. Alberto suffered a heart attack in the Calgary airport, while on their way to teach a tango workshop. Alberto very much wants to be treated by his own doctor back home in New Orleans. Valorie wrote that Medivac had been mentioned, but the cost is prohibitive. Laura Ingalls Gunn has organized an online auction to help generate dollars to be contributed to a fund to help pay Valorie and Alberto's expenses. 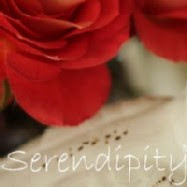 Several bloggers have already signed up to donate beautiful items. I hope you'll visit Laura HERE to view the auction items. Please bid with a generous heart, and bid often. I'm offering a set of ten vintage Libbey/Rock Sharpe tall sherbet/champagne glasses. I thought the stem shape was very beautiful and decided to purchase them at a local antiques mall. I thought they'd be perfect for appetizers, as well as for beverages and desserts. I've yet to use them for anything other than tablescape posts, most recently (and ironically) on a table I set using the beautiful Limoges bread plates Valorie gave me when I visited her in New Orleans. They shimmer in the combination of candle flames and late afternoon light, don't they? The book value of the ten stems would be approximately $100. To sweeten the deal, I'll also include this vintage, but unused (new in the box), hostess set of Wm. Rogers silverplated serving pieces. 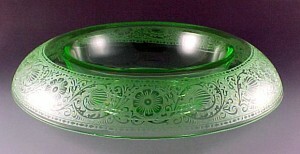 The mid-century pattern appears to be a 1950s design, or possibly early 60s. To be honest, I forgot I had the set and hadn't researched the pattern. 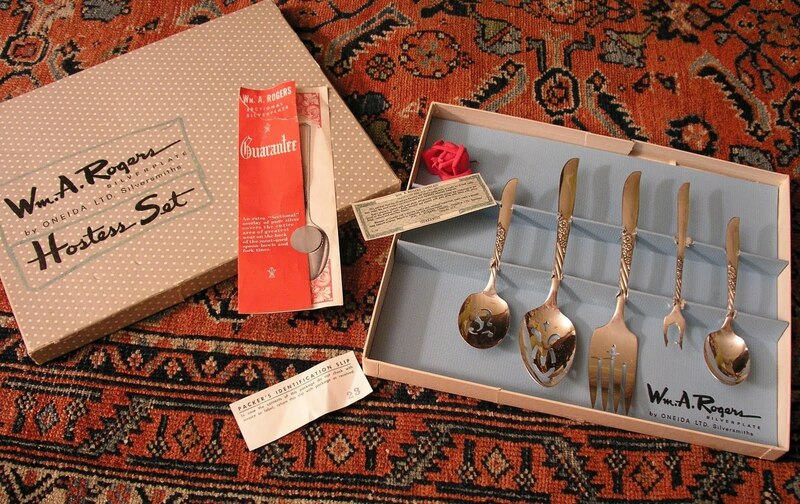 I do think it's beautiful, and I particularly like the lemon fork and slotted spoons. Far more than I like the hostess set, or the 1940s stemware, I admire, respect, and appreciate Valorie and Alberto. 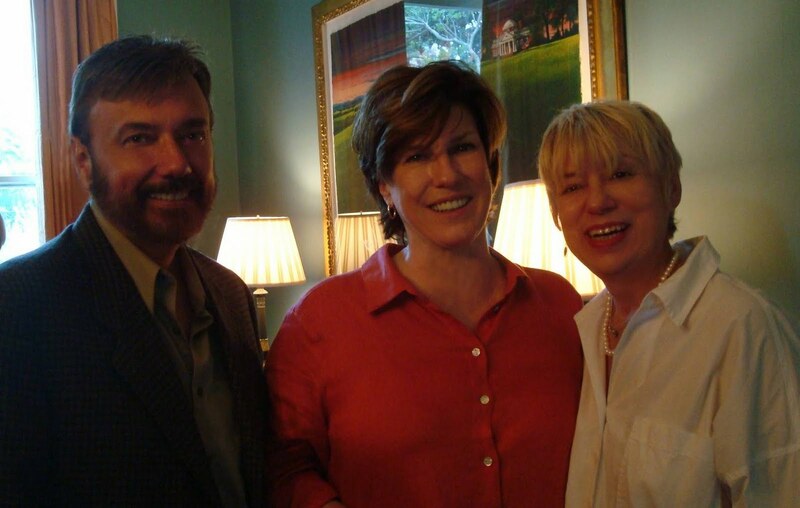 They were truly gracious, kind, warm, and welcoming when I had the good fortune of meeting then in NOLA. 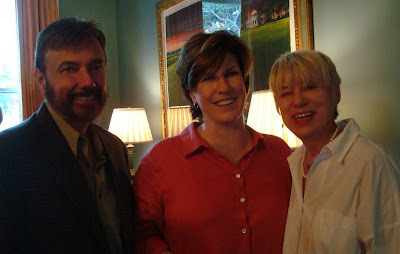 I have fond memories of having brunch with Valorie at gorgeous historic home of famed New Orleans author, Julia Reed. Valorie, Julia, and I are in the photo below. I'll be happy to pay the costs of shipping and insurance for buyers in the continental US. I don't know the value of the silverplated hostess set, but I think it's unusual to find pieces like this in their original packaging. The auction is for the ten Rock Sharpe stems and the hostess set. Please start the bidding at $25. Please note that bidding will end at 10am Central time. I will contact the high bidder at that time with payment instructions (directly to Valorie and Alberto's Paypal account). As soon as that's done, and I have a shipping address, the package will be sent via USPS priority mail. Thank you to everyone who placed bids and to those who have contributed directly. Your kindness is admirable and greatly appreciated. Update -- Bidding has now closed and the winner of the items is one of my favorite people in Blogland, Christine (Xinex) of Christine's Home and Travel Adventures. 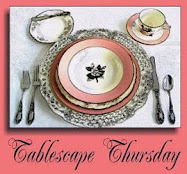 We can look forward to seeing these great vintage items beautifully displayed by Christine in an upcoming Tablescape Thursday post! Thank you, Christine, and congratulations! what a lovely gesture for your friends, I hope you do well for them. Although I would love to bid especially for the Hostess set, I know the postage will be so expensive!! Hi Dear Bill! Oh, this is a wonderful donation! I would like to add my tiny bid of $60. Our prayers are with Valorie and Alberto. I am just overwhelmed at your beautiful and generous donation. Thank you SO very much for participating. May the bids continue to climb for these wonderful gems. I can't bid, but I have a cousin who lives in Calgary if it might help. What a generous & wonderfully thoughtful thing to do, Bill! I think the Hostess Set is my Mom's pattern. It is Wm. A. ROGERS ONEIDA Silverplate & the pattern is Wildwood /Always from 1958. I'll up Laurie's bid. $80. I am downsizing my collections so I won't be bidding but I would like to donate $25.00. Thank you to you and to everyone who has been bidding! NEVERMIND my question above, Bill!! I just went to Paypal.com and plugged in "boutique@planet-tango.com" and I was able to donate. Since I won't be able to check the internet today, I put in my final bid of $110. Thank you to everyone who placed bids and to those who have contributed directly. Your kindness is admirable and greatly appreciated. We just came back from a trip to Argentina and just found your mail...hope The Vamp's husband is better and had the right treatment in New Orleans as he wanted. Please let me know how it all turned up. God bless you. I'm just finding out about this today. It is a very generous thing for you to do. I'm going over to paypal to see how it works.